Let us deliver a beautiful surprise for you today! 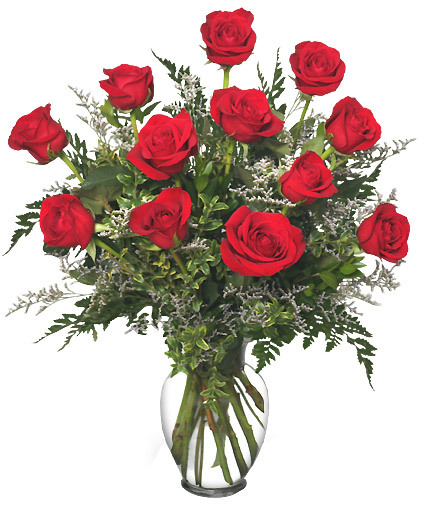 This vase of 12 brilliant red roses is an elegant and natural way to say, "I love you." Call our shop or order these roses online today! Remember, When your word's escape, our flower's speak! 12 premium long stemmed roses, a beautiful stuffed bear and a box of chocolates! Great savings and a great way to say I Love You! 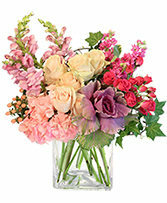 A Beautiful Vase of Gorgeous Tulips to Surprise Your Valentine. 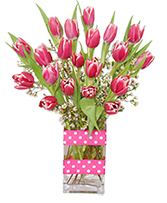 Filled with beautiful tulips and fragrant Wax Flower, Finished With a Ribbon.